These Watermelon Jello Shots are a party favorite! Jello shots are perfect to bring to BBQ's, potlucks, camping or any type of gathering. Cut watermelon in half and line a large baking sheet with paper towels. Do this near the refrigerator so you don’t have too far to carry it! Scoop out the fruit leaving about 1/4-inch inside the shell. Whisk watermelon flavored gelatin and unflavored gelatin into the boiling water until dissolved. Stir in the cold vodka. Pour gelatin mixture into the two watermelon halves and transfer to the refrigerator. Chill for four hours or more. After your gelatin has set, remove one of the watermelon halves from the fridge and place it on a cutting board. Use a sharp knife to cut 1-inch slices. The gelatin will be nice and firm because of the added unflavored gelatin in the recipe. Even though you filled the watermelon rind with liquid gelatin, when it solidified, it shrank too. You can trim the excess tips off of each slice. Cut each watermelon slice into three triangles. Repeat with second watermelon half. Cut limes in half and juice them, then scoop out the fruit. The easiest way to do this is to pull at the pith and fruit near the top of the lime half. It's fairly easy to pull out once you loosen it. Line a muffin pan with cupcake liners and place each lime shell inside a liner. Whisk watermelon flavored gelatin into boiling water until dissolved. Stir in cold vodka and carefully pour spiked gelatin into lime shells. Using a sharp knife, cut each lime shell in half and serve. 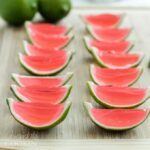 This recipe for Watermelon Jello Shots – 2 Ways was printed from AmandasCookin.com - https://amandascookin.com/watermelon-jello-shots-2-ways/ and can only be printed for education or personal use.